We love the sound of children in the Sanctuary in worship. They give us energy and delight; we encourage full participation in whatever way parents decide is appropriate for their child. Parents are encouraged to bring their children into the Sanctuary every Sunday morning. The best way to teach children about the joys of worship is to sing the hymns and pray the prayers alongside your children every Sunday. Children who worship regularly alongside good parental role models when they are young are more likely to worship as adults. Support them as they sing along, allow them to dance and move as their hearts desire. Coloring books and supplies, as well as quiet toys, are available in the back of the Sanctuary. Prior to the sermon, the pastor invites the children to come forward to hear a special children’s message. Parents are welcome to accompany their children, especially if they are reluctant to participate. After the children’s sermon, kids are invited to participate in spiritual education outside the sanctuary. Pre-K children meet in one room with adult volunteers to sing songs, color, and play. Grade schoolers meet in another room with adult volunteers to discuss a selection from the day’s scripture reading and participate in fun scripture-based activities. There will be time for some singing and learning music; there will be times when the older children will borrow books from Pastor Christine’s lending library and read to the younger ones. If you are interested in helping with children’s education on Sundays, please contact Pastor Christine Core. BLC’s practice is to commune children as soon as parents wish their children to receive the consecrated elements. However, when infants and young children are communed, parents and sponsors with the support of the pastors, should instruct how receiving Holy Communion is receiving God’s gifts of forgiveness of sin, life, and salvation.This is part of anyone’s lifelong journey of faith development. With parent or other caring adult assistance and coaching, children as young as four or five are encouraged to learn the task of ushering: handing out worship bulletins and collecting offering. Children can be scheduled to Usher as often as parents wish. As soon as a child is able (usually about grade 1 or 2), the pastors will happy to work with parents and children to instruct them in the proper serving of the Communion grape juice. 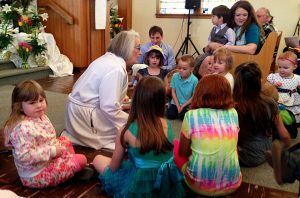 Children can be scheduled to serve Communion as often as parents wish. Once children become fluent readers and overcome any fear of standing in front of an “audience”, the pastors will be happy to train them to read the lessons from scripture for any given Sunday morning. Older elementary age children love the opportunity to set the table for Holy Communion. As soon as a child is able, about grade 2, the pastors will instruct a child and their parent on the proper way to set the Table for Sunday morning’s Holy Communion Service and how to clear the Table and clean the chalices and paten. Elementary age children will need parent help until they learn the task after which they can perform the Sacristan duties independently. On the first Saturday of every month, we’d like to invite children of all ages for Super Service Saturdays. We will enjoy time to gather, play and sing. We’ll have planned a “work party” of various jobs around Bethel that need doing, a time to consider a story from our Christian faith, perhaps a game or a simple craft. Before we say goodbye for the day we’ll serve a small snack. We will also be intentional about inviting all of the kids connected to Bethel – Grandma, Grandpa – get ready for an invite. Together with the children of BLC, Pastor Christine will be forming what parents and grandparents may have called Confirmation Class. We will gather at a time to be determined to talk all things Bible and Luther. This is also a time for our older children to become closer to one another, participate in community service as well as ask questions of importance to them in a safe space that is not also occupied by parents. If your child is younger than fifth grade, but you think they would benefit from a little more conversation, please talk with Pastor C.